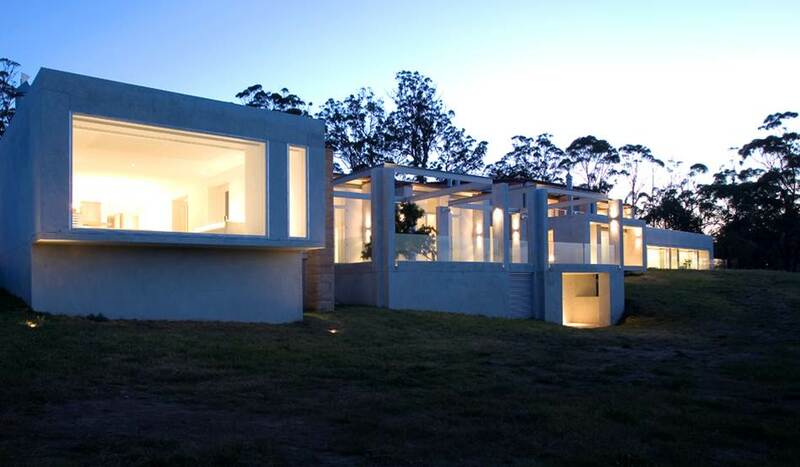 Alex Popov’s architecture is an architecture of ‘mass’ brought to life by a singular clarity of composition and construction, combined with serene interior spaces… Popov’s recent work has become one of the most significant expressions of Australian contemporary architecture. ‘Popov, Selected Works 1999-2007’ examines 10 of his most recent projects through sketches, formal drawings and extensive photography. 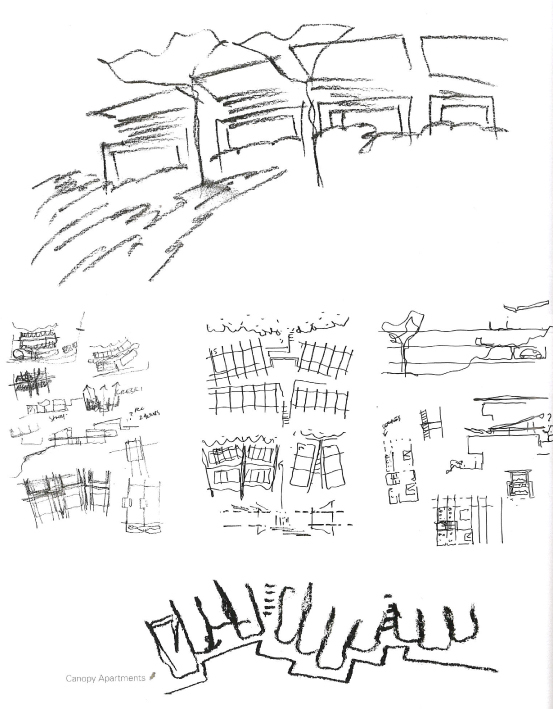 his architectural process can be traced, from the first sketches when the design emerges, through his structural approach to planning and configuration, to the completed buildings themselves. 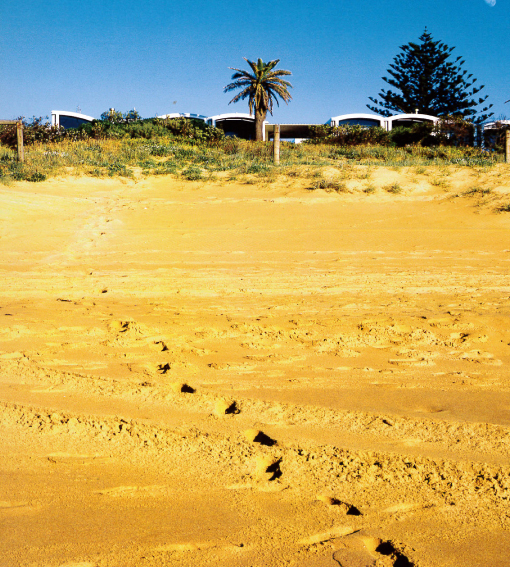 For the past two decades, the dominate approach has been one driven by a relationship of reciprocity: a mimetic dialogue that takes visual cues from the landscape itself and from recollections of rural vernaculars, and in doing so supposes a satisfyingly recognizable idea of Australian Identity. The architecture of Alex Popov, in contrast, is firmly grounded in an abstract monumentality. His response is not mimetic, it does not attempt to merge into or become one with the context, but rather, it establishes a relationship through juxtaposition and contrast, through the framing of views and then of the light-filled spatial experience within. 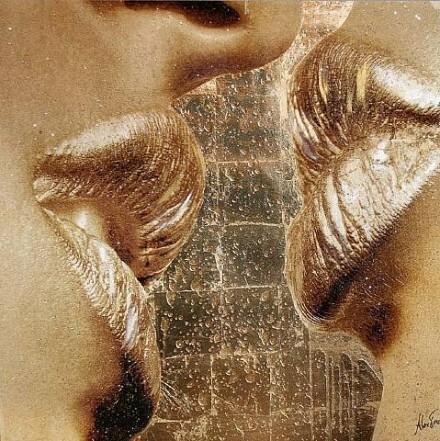 The dialogue is cerebral in its abstraction, but lyrical in its experienced reality. Raw yet refined, still yet dynamic, disciplined yet intensely sculptural of these ideas and the landscape. 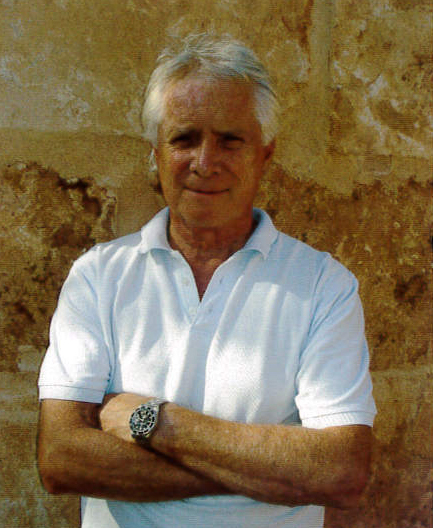 Popov was born 3 February 1942, in Shanghai of Russian parents and moved to Sydney aged twelve. 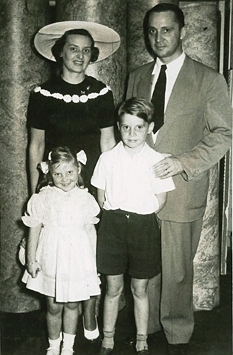 He was educated at Newington College (1958-1960) and the University of Sydney before studying further in Denmark. Popov graduated in architecture from the Royal Danish Academy of Art in 1971 and then worked with Henning Larsen and Jorn Utzon (to whose daughter Lin he was married for some time). 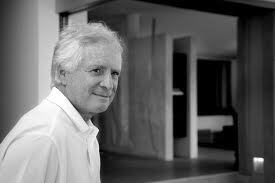 He returned to Australia in 1983 and established Alex Popov Architects Pty Ltd (now known as Alex Popov & Associates). 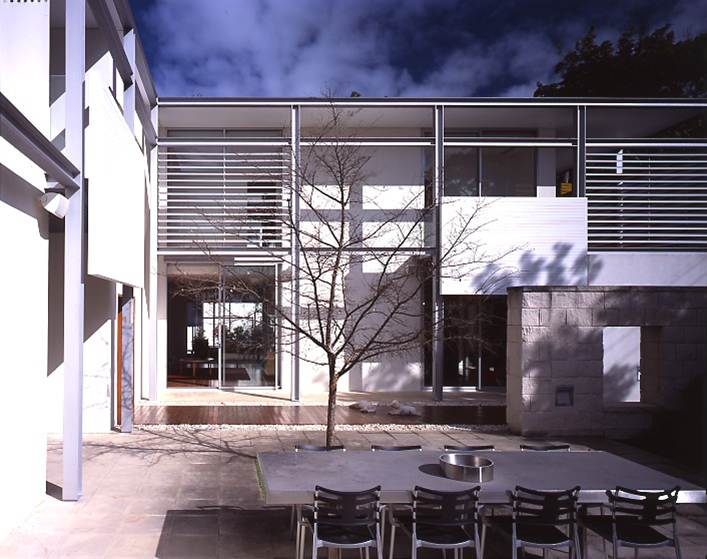 The practice has been successful in a number of design competitions and has received numerous major awards from the Royal Australian Institute of Architects including several Wilkinson Awards and the Robin Boyd Award. 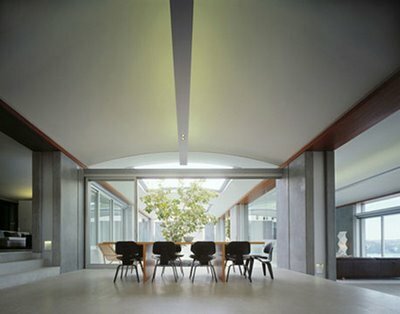 A visit to Popov Bass Architects is a uniquely Sydney experience. 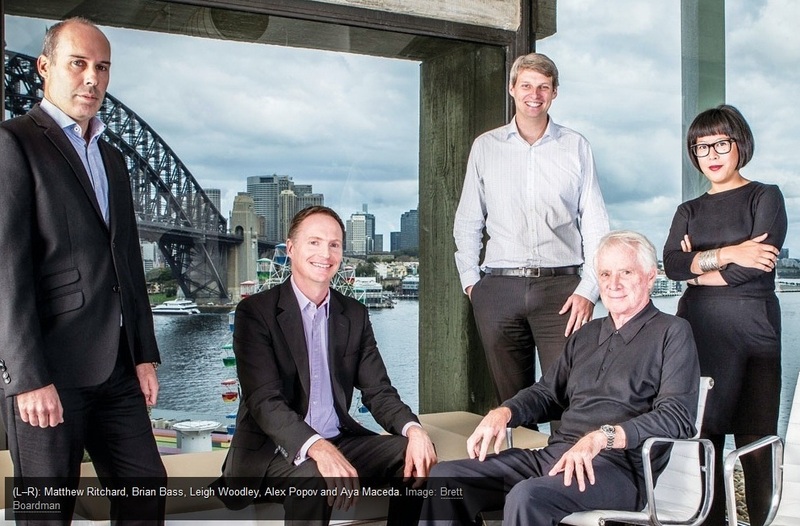 Occupying a corner suite in an iconic Harry Seidler building overlooking Sydney Harbour, the firm’s open-plan office enjoys expansive views of the city and the suburbs beyond. 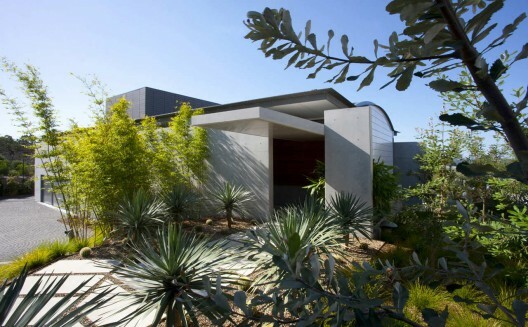 It seems an appropriate base for a practice whose light-filled dwellings are informed by an intimate understanding of contemporary urban Australian lifestyle. 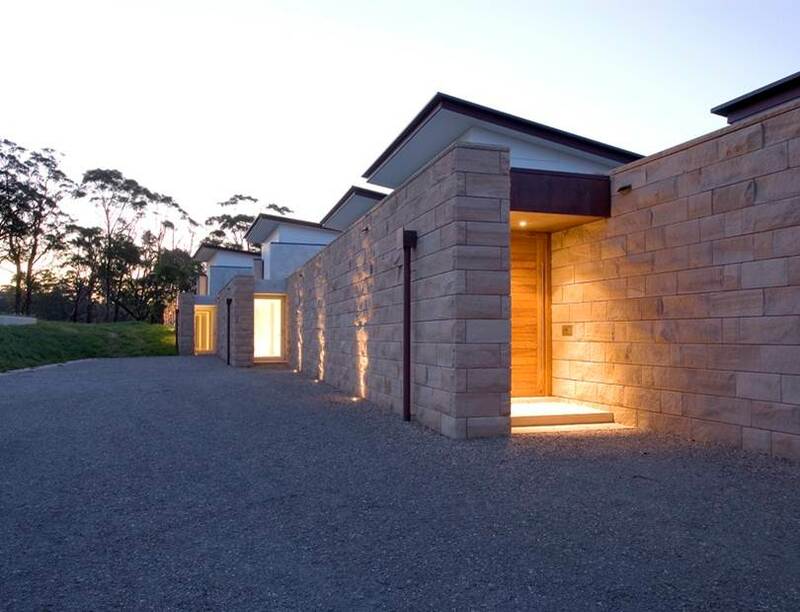 Combining his European experience with an appreciation of the local climate and culture, Alex soon gained recognition for several award-winning houses whose solid forms were firmly grounded in the rugged sandstone terrain of Sydney’s northern suburbs. 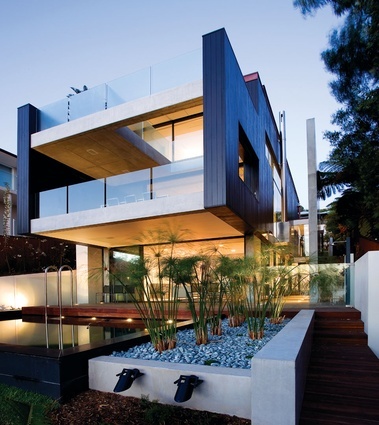 Over the past thirty years the practice has increasingly drawn on its extensive private residential experience to inform the design of multi-residential buildings. 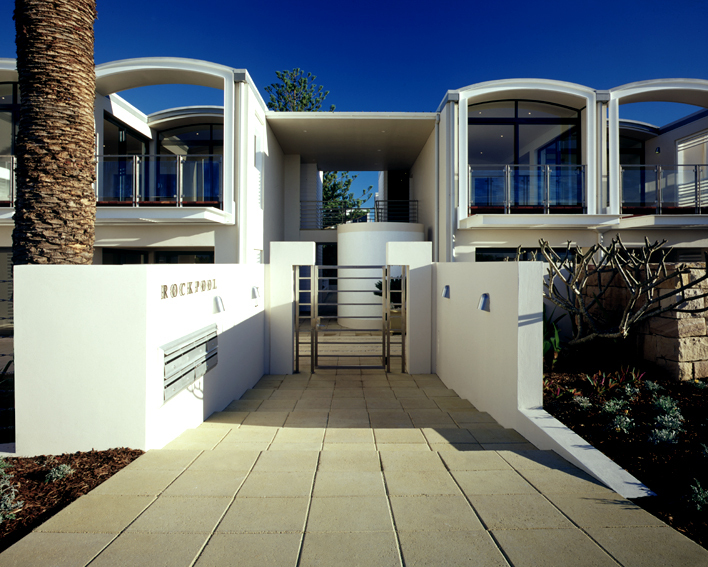 With the appointment of Brian Bass as a director in 2007, the company relaunched as Popov Bass Architects, a medium-sized practice with a focus on residential architecture ranging from suburban Sydney houses to multi-residential developments both interstate and overseas. Popov’s architecture does not contain reassuring signifiers of what Sydney has come to expect from contextually responsive architecture: as with Jorn Utzon, his process with site and often with very difficult steeply-slopping or awkward sites. 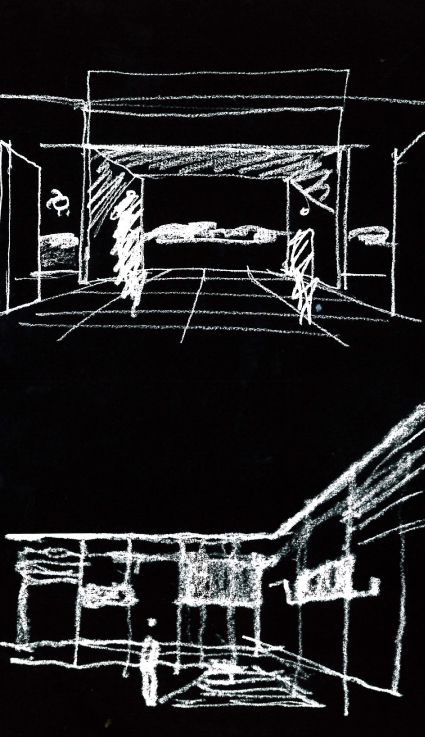 On site, Popov starts at the scale of the room, where he imagines and then tests a possible interior within which to dwell. Shifting scale, the site is then conceptualized as an interior into which the architecture is placed, an architecture that must have dialogue with its surrounding context and topography. 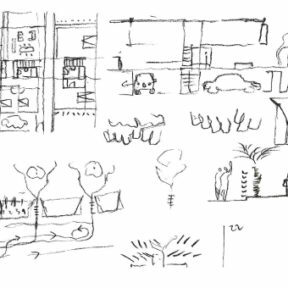 These very basic ideas of in-habitation of both the world, and intrinsic to this is the design of spaces that inter-relate – in the manner of Louis Kahn- and establish a ‘community is fostered, while providing for individual needs of refuge and privacy. From the outset, the architecture of Alex Popov possessed gravitas: it literally had more mass than that of his contemporaries. 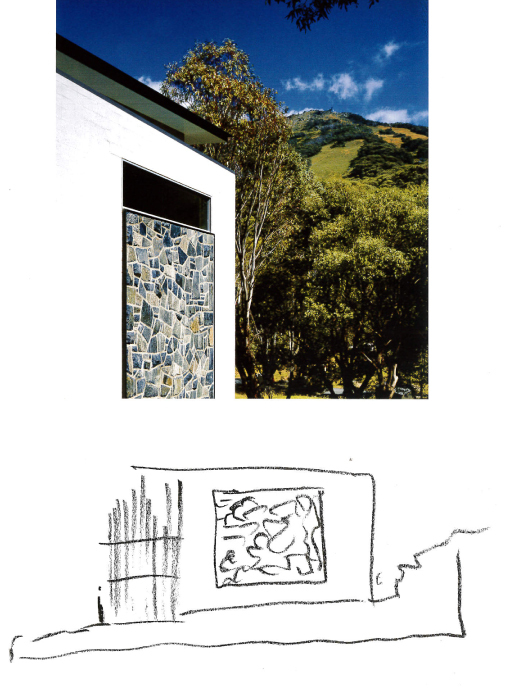 Where his fellow architects took poetic and formal inspiration from what grew out of the landscape, it was the landscape itself- the sandstone, the mass and the tectonic robustness- that inspired him. 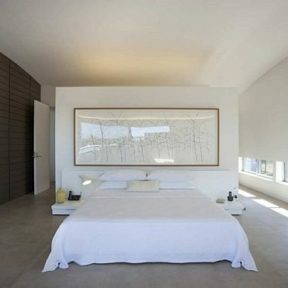 What brings this mass to life is the clarity of the composition and construction combined with the internal spatiality, which is light-filled, serene and generous. 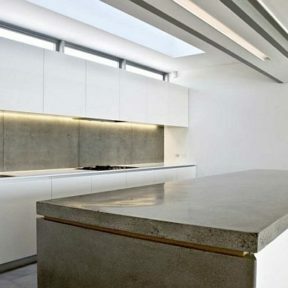 As with Kahn, Le Corbusier and Utzon, light is controlled and manipulated in such a way as to animate and enliven massive forms and planar surfaces. 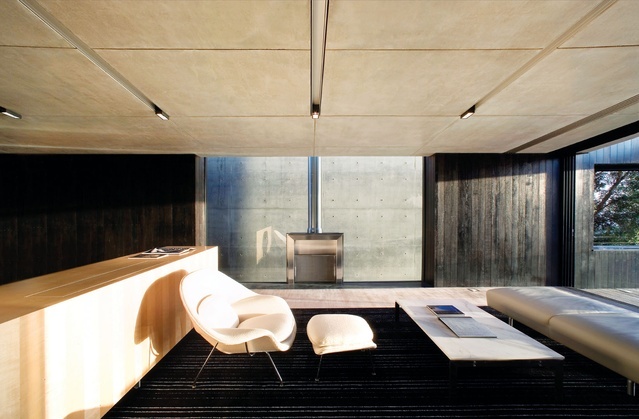 The result is an architecture that embodies an austere and elegant simplicity without falling away into a brutal and severe minimalism. 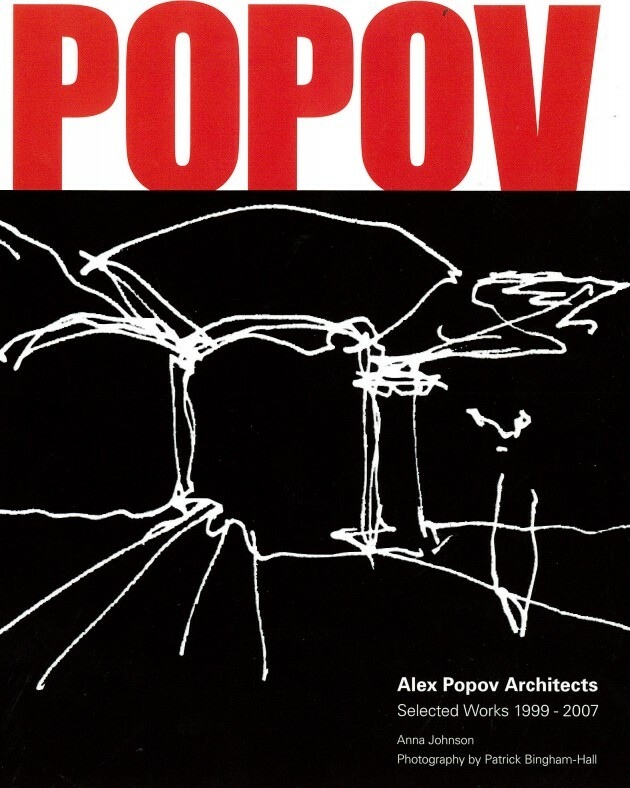 To be well versed in precedent, but not to mimic a given style, is explicit in Popov’s architecture. 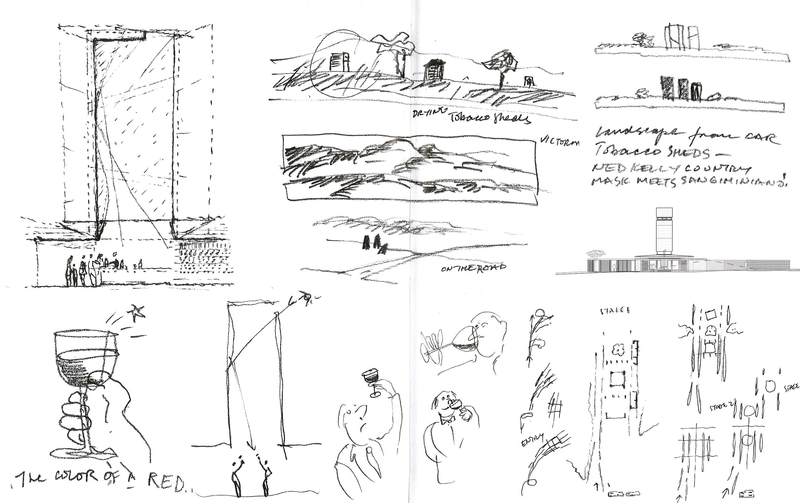 During his training with Utzon, books about architecture without architects would be handed out in the office: books on the structures of nomadic cultures, or African and Moroccan buildings, or Chinese buildings. 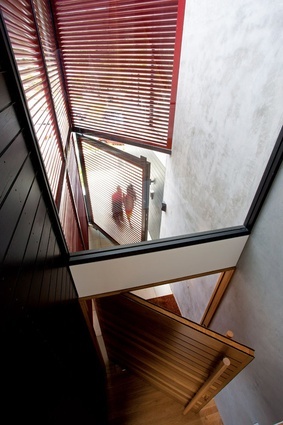 “Utzon wanted to push us into genuine architectural response. He argued against an architecture of aesthetes, of elitism and formalism, and instead argued for an architecture of connections.” For Popov , this idea of connection extends throughout all the possibilities of architecture and “the problem that is the building.” The primary connection, the thing that holds all the pieces together, is an idea of structure: “This is about the assembly and its connection to space and form.” this does not necessarily refer to construction, but literally to an underlying structure that drives the expression and holds the work together. The absolute clarity of Popov’s architecture demonstrates this notion: nothing is in excess, and the assembly is driven by a structuring idea, which for the most part addresses site, place and the interior spatiality. 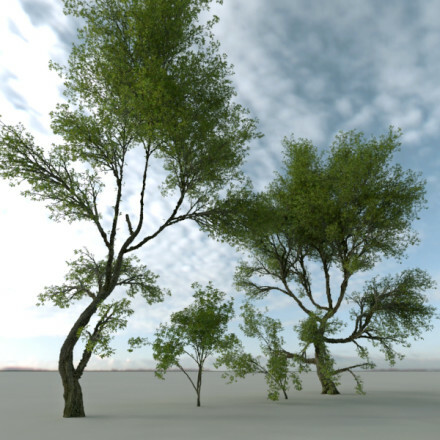 For Popov, all aesthetics “… deal with structuralism. The site has to be studied and then the connections begin. How will people behave and respond to the site? 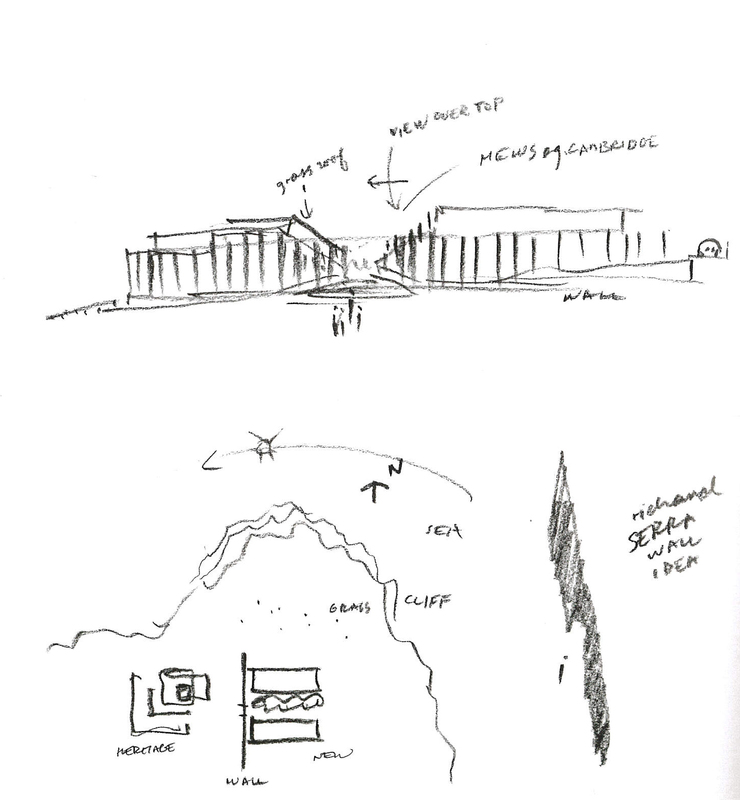 What does the program demand?” And then, as Popov continues, “… there’s that almost intangible abstract part that Louis Kahn so beautifully describes as ‘what the building wants to be’, the moment the design comes through.” Popov’s architecture is not derived from inspirations: it emerges from his rigorous process of investigation and testing. His idea of assembly is critically important to Popov’s methodology. He constantly refers to the term, not so much as a reference to a repeatable and recognizable kit of parts, but as an accurate description of his structural approach to design. 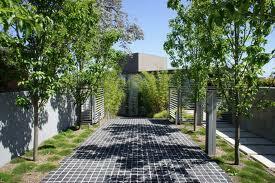 The assembly is the overall configuration of the building, the planning and the building components. 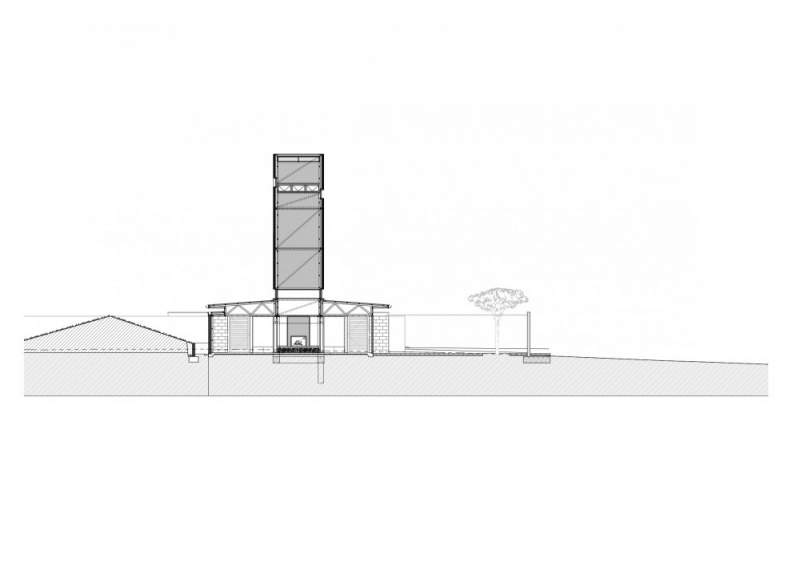 And for the design to really come to life, the planning and exterior expression needs to reflect that assembly, and Popov has a kinship with the work of Kahn and Utzon, architects who have an almost tangible legibility and clarity to their work. Japanese architecture and traditional Chinese buildings are also central influences for Popov. 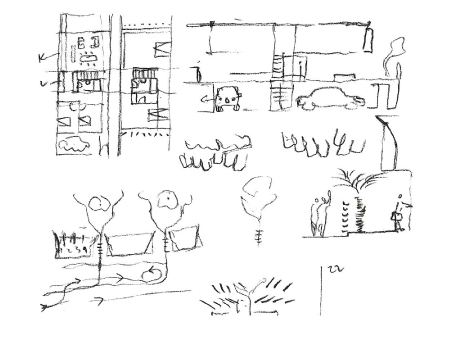 Popov’s ‘archetypal gestures’ of courtyard, promenade, framed views and pavilion forms. This ‘world within a world’ is given further emphasis by making a clear distinction between the often unassuming and modest entry and that which lies behind. Popov’s Danish architectural education placed considerable importance on the interior of the house, and the way in which it’s design responded to individual people and then to groups of individuals. 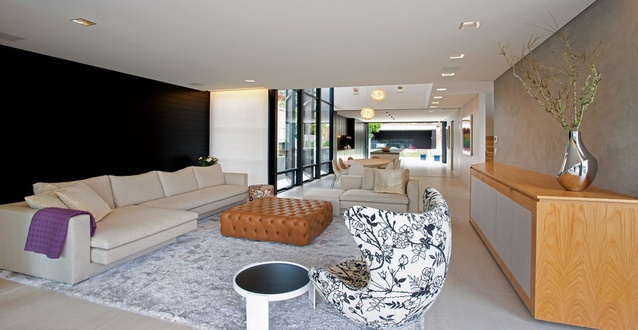 As a result, the narrative of interior spatiallity is of paramount importance. For Popov, that interior must provide for the needs of the individual as well as for the collective family, while engaging in a very tangible and fluid relationship with the exterior, the light and the context. 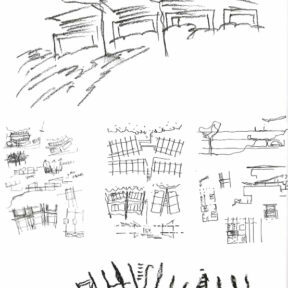 Drawing is so obviously a critical part of Popov’s process: marks on paper effortlessly capturing ideas, spatial moments, and interpretations of site, place and form. 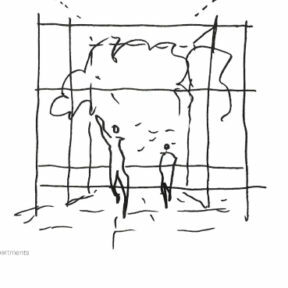 The drawing becomes a document and a gesture, but is also within these drawings that the design first appears and develops. 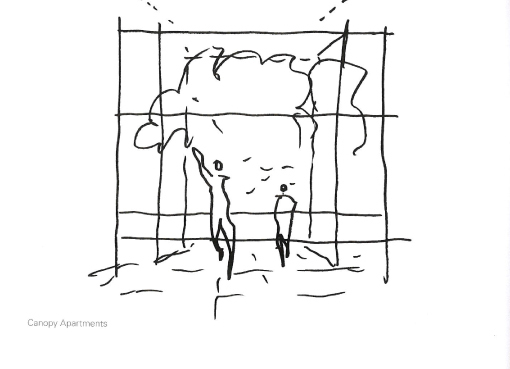 The drawing is a site of emergence, and becomes generative through its function as representation. It is this potential of the drawing that translates so beautifully in Popov’s images. 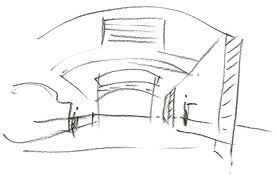 But, as with his architecture, the drawing is disciplined, and it is a pragmatic and rapid communication tool. 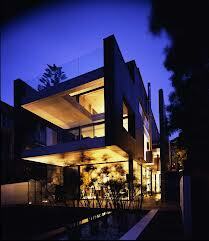 Houses also provide fertile ground for testing architectural concepts. 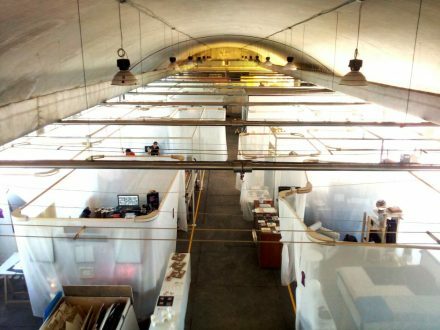 One such idea is the principle of additive assembly, which can be equally applied to the design of single residences and group housing. “Additive means that you develop a series of components and these components can be married in order to become larger or smaller,” Alex explains. 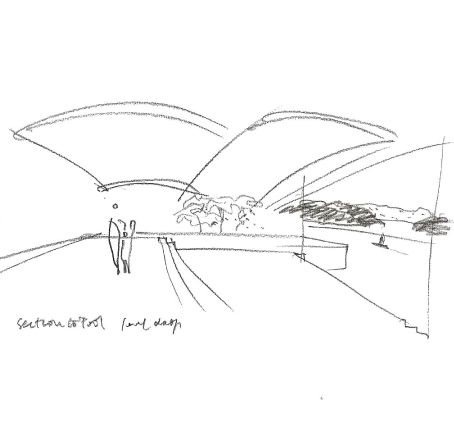 The iconic image of Rockpool’s vaulted roof forms, clearly visible from Mona Vale beach, has become synonymous with the architecture of Alex Popov. 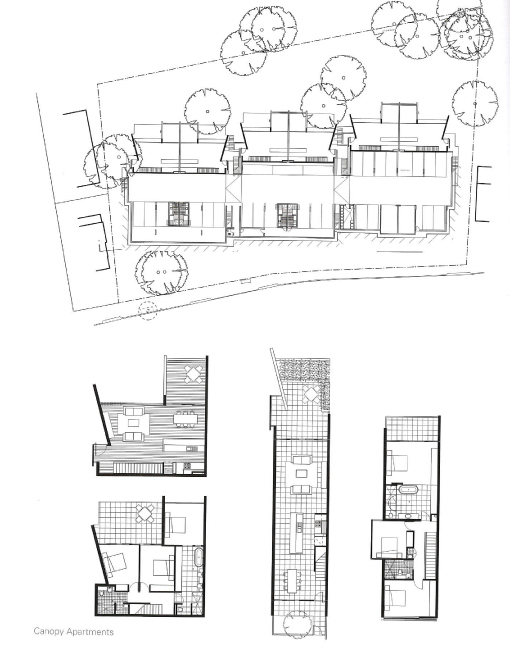 This was Popov’s first medium density housing project, one that allowed him to extend his explorations of dwelling beyond the scale of the private house. 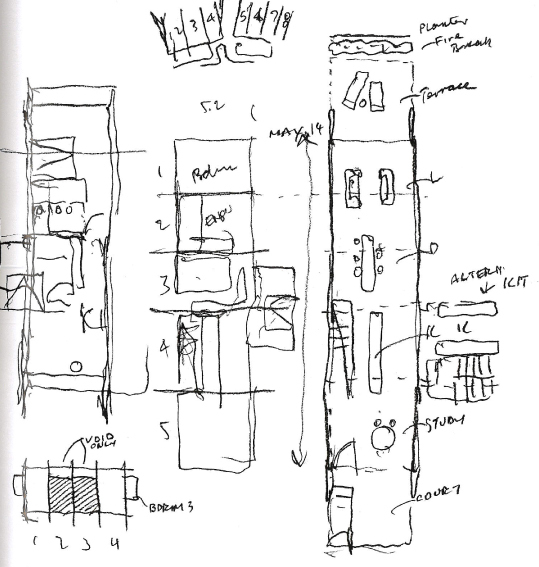 The plan shows a configuration of seventeen apartments organized in two rows separated by a public garden: thus the internal street evident in many of Popov’s earlier houses now becomes a device for public circulation along the entire length of the spine of the project. 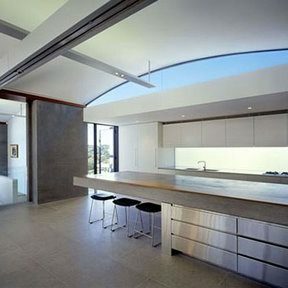 The steel framing system, incorporating vaulted roof forms and parallel brick walls, permits a variety of arrangements. The eastern apartments occupy one level, either ground or first floor, with two parallel vaulted shells roofing the first floor apartments, which are configured either as living and dining areas under one vault with bedrooms beneath the other, or as living and dining areas under two vaults with bedrooms at the rear. Single vault units, to the west of the internal street, have living and dining areas on the ground floor, with bedrooms above. 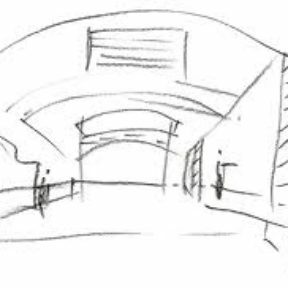 In the apartments the apartments facing the sea, as Popov so elegantly demonstrates in his sketches, the gentle curvature of the ceiling acts as a counterpoint to the expansive horizon, while establishing a harmonious spatiality within which to experience the views. Spatial narrative leading towards particular moments are developed both within the individual dwellings and throughout the entire project, and this idea of community relationship is extended, at an urban scale, in the way that the development engages with the living spaces looking directly out to the streetscape above a low sandstone wall that shields the sleeping areas and provides a warm contrast to the white-rendered brick walls and the steel frames. The assembly system of this house, a framing steel structure with glass and concrete infill, continues Popov’s extensive interest in post-war modernism. 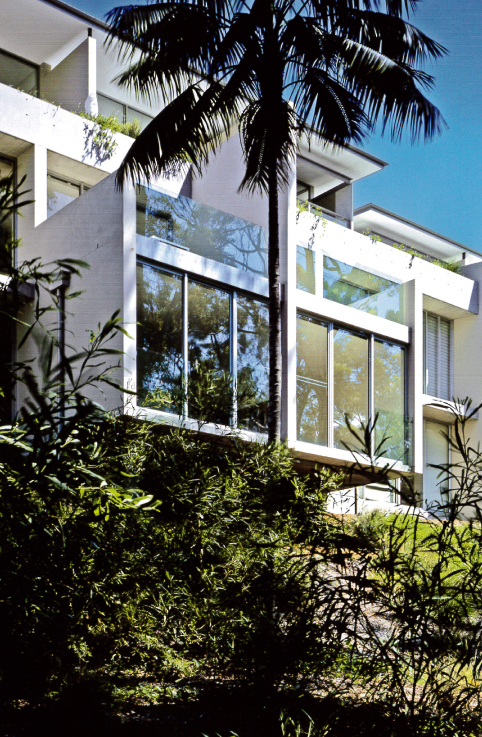 In particular, John Entenza’s California Case Study House program (1945-1966) forms the precedent for this project, along with an earlier Popov project, the Middle Head House (1999-2000) in Mosman, NSW. 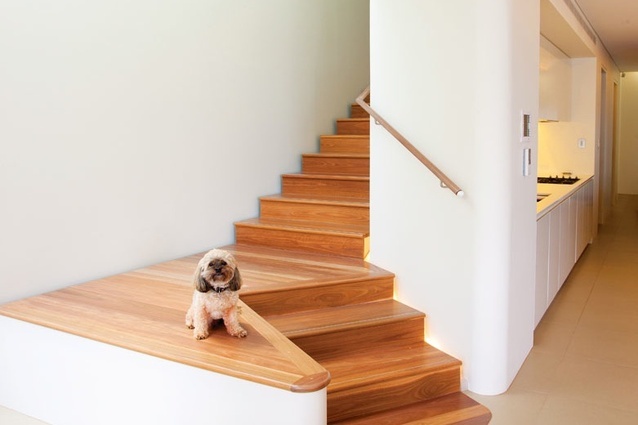 The vocabulary and structural system employed in the Middle Head House is continued and refined in the Choy House, and Popov’s interests have here been sharped with a collection of modernist sculpture and furniture being accommodated within the home. 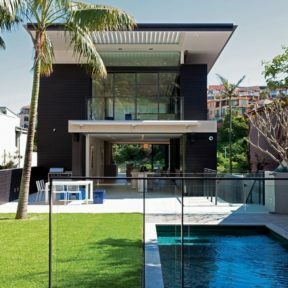 A difficult corner site, and Castlecrag’s strict planning and heritage regulations, made the architects task a challenging one. 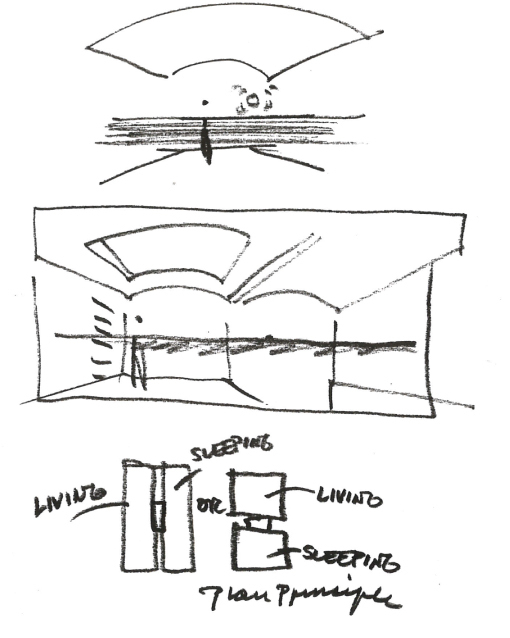 In response, Popov designed a two-storey volume comprised of two rectangular wings aligned at right angles and pushed to the southwest corner to allow for maximum northern light and exposure to the views. 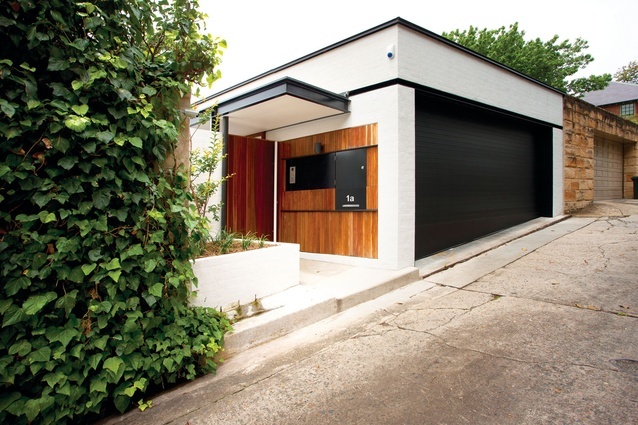 A curved sandstone wall was placed adjacent to the street frontage, thus satisfying heritage requirements for a response to the local sandstone vernacular while also creating a private courtyard between the house and the street. 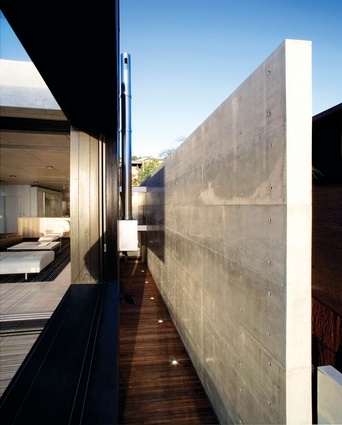 As with the Middle Head House, a steel framing system defines the cubic volumes and frames particular views of the site and the house. 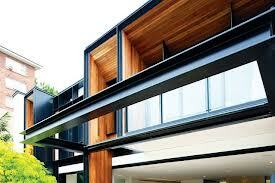 The framing system has been revised to contain all the ancillary devices, such as louvers, down-pipes and overhangs. Spatially, the volume and program emerge from beneath the primary steel structure, and into this system Popov inserts a void space and a sequence of dining, living and sleeping areas. 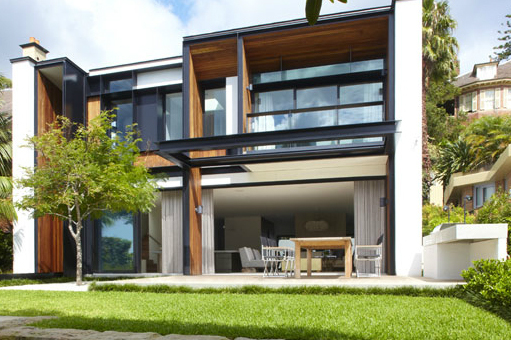 The resulting porous building envelope acknowledges Sydney’s sub-tropical climate while providing a ‘neat and orderly’ addition to Castlecrag’s renowned collection of domestic architecture. 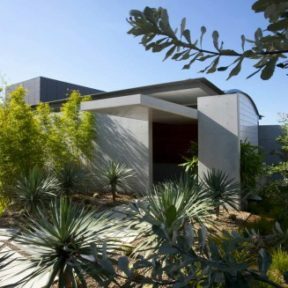 With its lofty steel structure rising above the sandstone wall and surrounding vegetation, the house is clearly visible from the street and is animated by an abstraction found in the play of cubic steel frames, voids, levels of transparency and white planar walls. 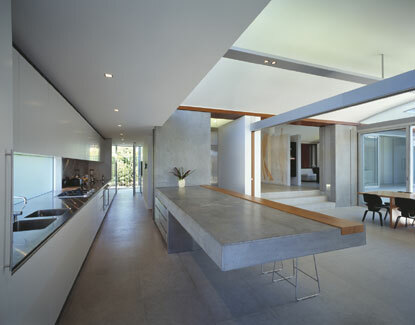 This is clearly demonstrated in the Northbridge House, where a series of vaulted roofs supported on parallel concrete columns creates a sense of spatial expansion. 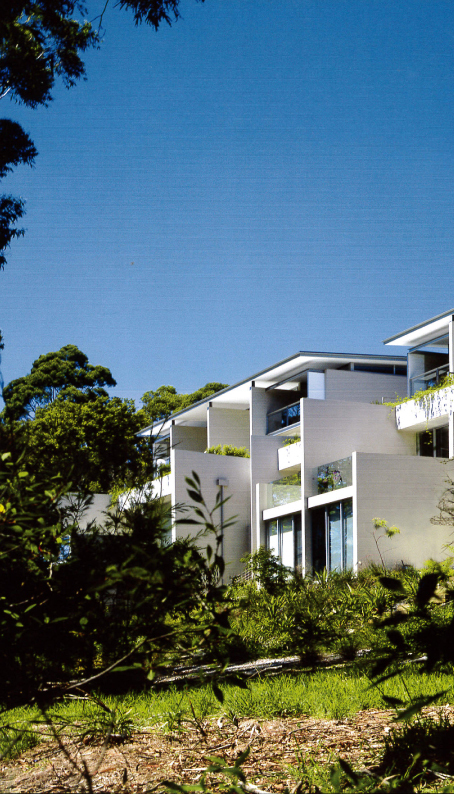 Located on a sloped site overlooking Middle Harbour, the house presents a modest facade to the street. 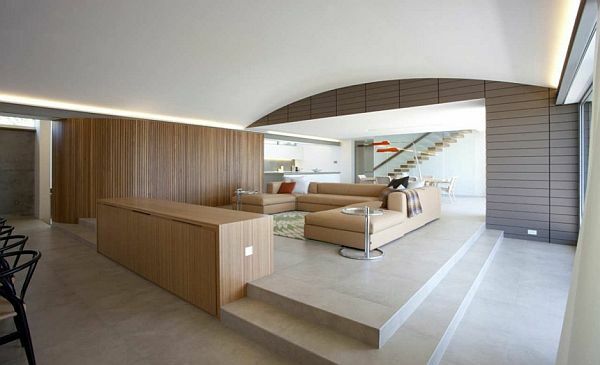 Internally however, the spacious interior unfolds under the rolling curves of the roof with an open-plan living area terracing gently down towards the view. 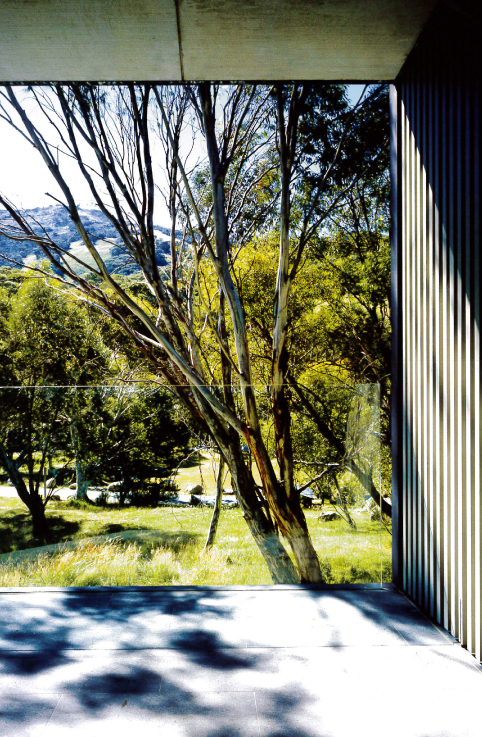 The architecture of all new projects in Thredbo is governed by the very particular covenants and requirements set by the local authority, including those for pitched roofs and for the mandatory use of timber and stone. 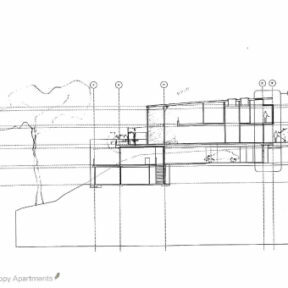 Not surprisingly, Popov’s approach was to challenge the imposed aesthetic and offer an alternative response, in this case lightweight Miesian apartment block: very finely detailed and elegant, but sufficiently robust to withstand the extreme climate and the requirements for ski equipment and storage. The building is composed of four three-storey apartments, each with floor-to-ceiling views across to the mountains, and an almost flat roof, which projects far enough out to protect the apartments from the snow and shield them from the summer sun. 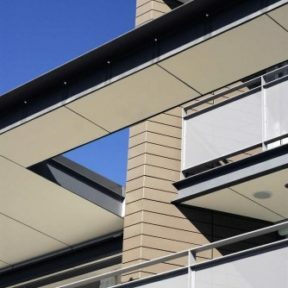 Aalto-like timber louvered panels extend perpendicular to the facade and establish a graphic rhythm across the front elevation. Continuing his witty interpretation of the local vernacular and of the authority’s requirement for the use of a stone base, Popov designed a steel-framed stone panel that is simply attached to the side of the building as if it were a mural. In contrast to the fine external steel detailing, the interior utilizes stone materials, including a black slate floor that can cope with heavy ski boots and equipment. 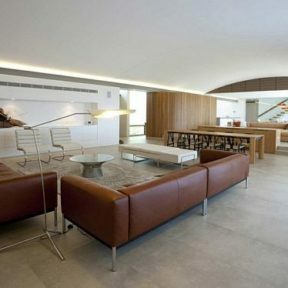 The project has many similarities to the Canopy Apartments, displaying the same exacting precision of formal resolution, but the planning and organization is in the reverse order to Canopy: the ground floor comprises an open plan living, kitchen and dining area; and the public circulation and access is from the front, rather than the rear. As it introduced a refined modern aesthetic to an increasingly stolid collection of ski-lodges, Popov’s building was initially greeted with surprise, but it is now admired for its almost crystal-like delicacy. 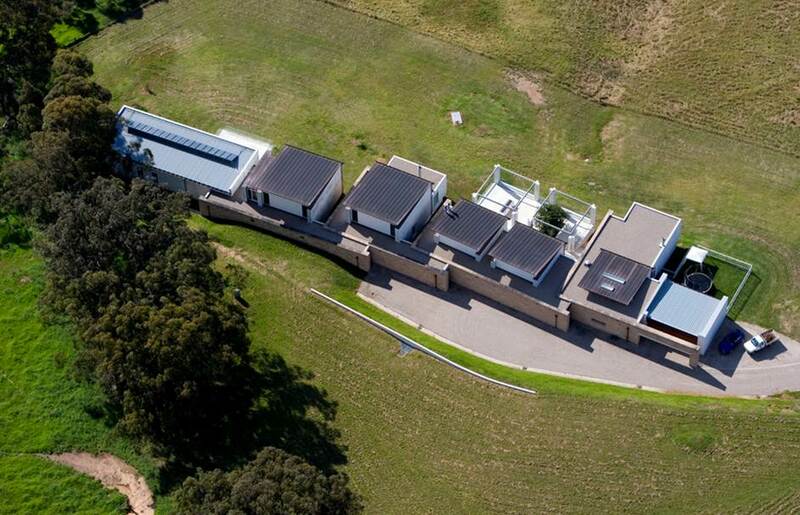 The brief for this house, in a pastoral setting overlooking Mittagong, was compellingly simply: to provide a series of pavilions that separately accommodate each part of the domestic program. 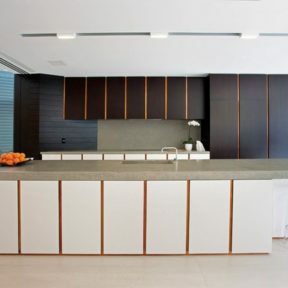 And in keeping with the client’s love of Spanish modernist houses, Popov was asked to provide expansive outdoor terraces, simple unadorned geometries and generous living spaces. 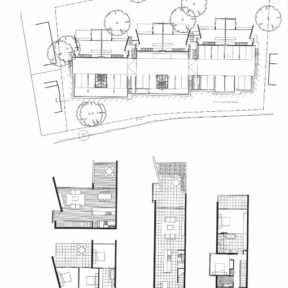 The idea was that the configuration of the house would allow each family member to have their own place of refuge while remaining connected to a village-like assembly of pavilions, and any further additions to the residence could then be made following this planning strategy. 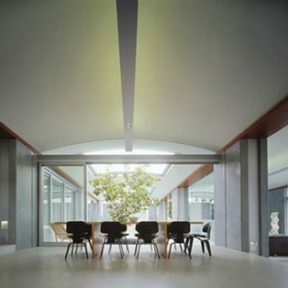 the spine that connects the pavilions is an ‘internal street’, which runs almost the entire 90 metre length of the house. 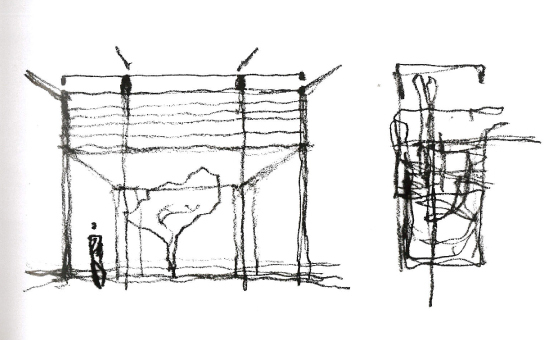 This strategy of semi-autonomous pavilions as a solution to a domestic program is one Popov developed and tested in his own Can Lin house (1976-1982) in Mallorca, Spain and in several early Australian projects. the experience of moving off the corridor and into and through the pavilions is one of the spatial delights of these projects, where very thick walls with deep angled cuts serve to frame moments of the building and the journey that has just been traversed. 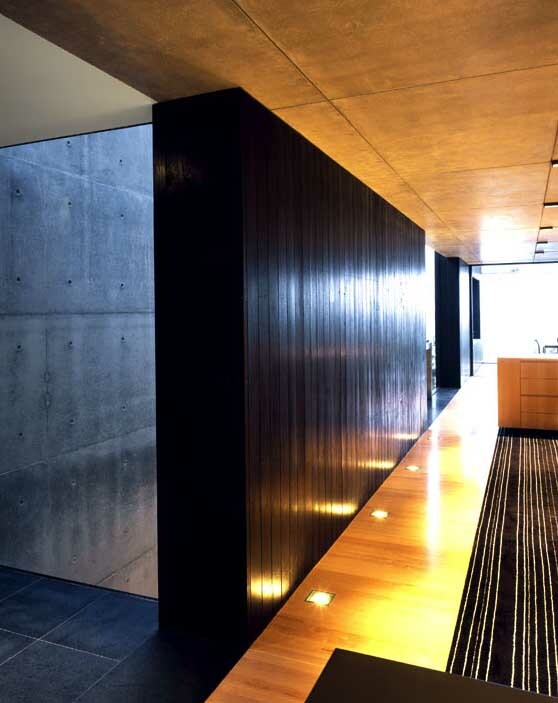 This treatment of deep reveals and massive walls is continued tot eh periphery of the house, where they serve both as apertures for particular views and as a means of bringing reflected light into the interior. 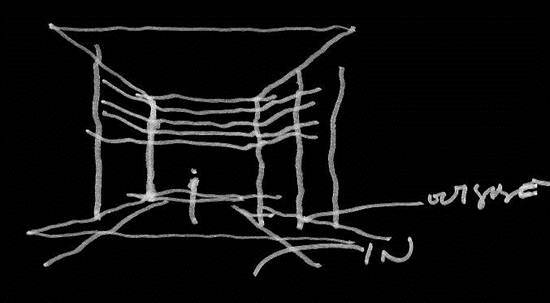 This simple gesture also reflects Popov’s affinity with Louis Kahn, and the desire to have ‘openings without frames’. 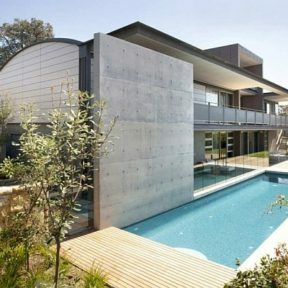 This low-slung but monumental building- for which Jorn Utzon’s notiong of ‘crystal clear forms on a site- adjusted base’ provides a clear precedent- spreads out in a linear fashion with varying rhythms of enclosure and exposure, and privacy and connection. 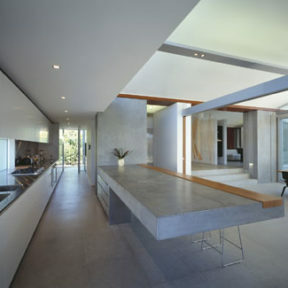 The house is appropriately grounded and protected from the location’s climatic extremes of heat and icy cold, but the real success if the project is the episodic journey across the site, into and out of the various domestic spaces, and in the way the site is persistently and discreetly folded back into the program. 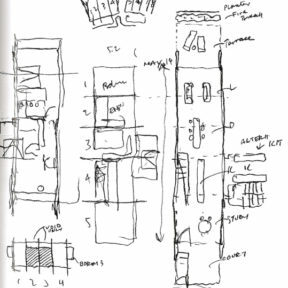 The plan form, which clearly expresses this domestic narrative, also resonates with Popov’s love of the Chinese temple form and the systematic way in which it allows for both a clear building assembly and a ritualistic procession through space and form. 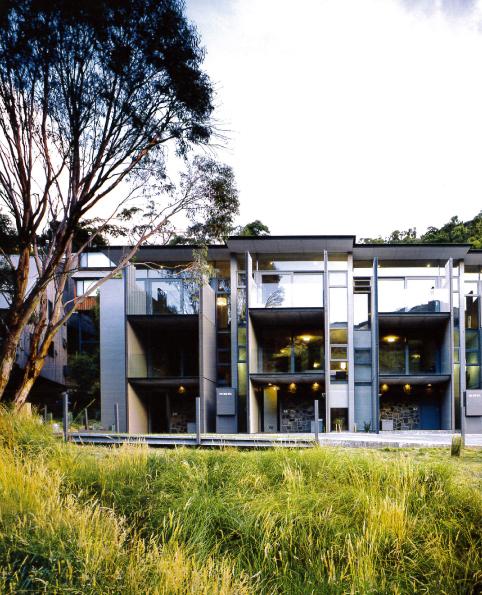 The quality of these apartments, perched on a steep north-facing site four kilometres from Sydney’s CBD, is comparable to that of Popov’s private houses and, subsequently, developers and potential occupants have accepted his medium density model as a commercially and architecturally viable dwelling alternative. 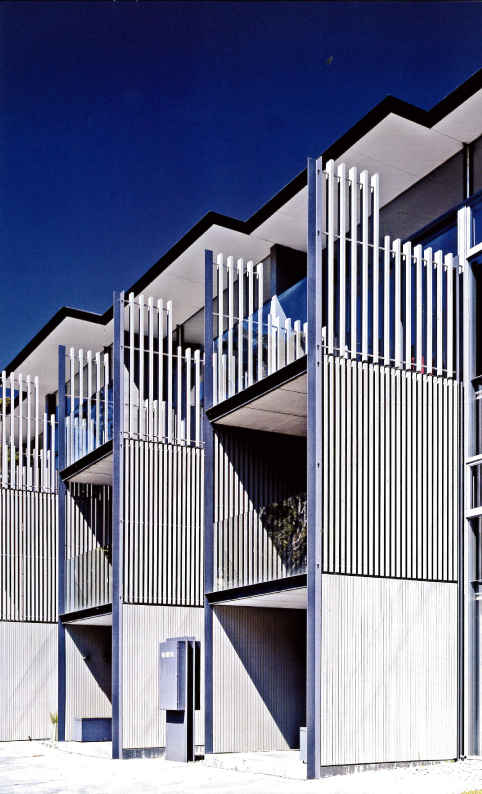 Conceived as a response to the urban bushland topography, the eighteen apartments are divided into two connected rows that are terraced down the slope, and these rows are divided into three blocks separated by landscape corridors and ‘internal streets.’ As a result, the ground floor of the lower row of apartments sits in close proximity to the existing ground level, and the buildings appear to be an extension of the landscape. 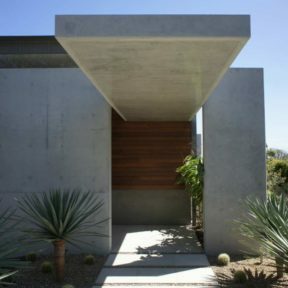 Significantly, their impact is also minimal from the street, with the southern facade animated by a steel frame and a series of adjustable horizontal louvers. 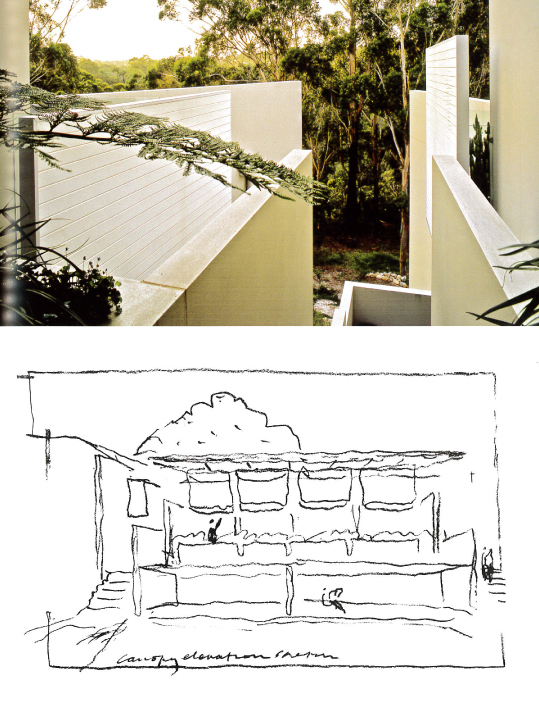 The planning of the units follows two models: the first explained by Popov as “an evolution of a terrace house type”, planned with minimal internal walls to create open-plan living areas that open onto private courtyards at either end; with the second as a slightly wider alternative model leading to a double-height volume at the northern end. A series of supporting parallel masonry walls are filled with fine steel frames at either end, which contain glass or timber panels that respond to the internal planning configuration. 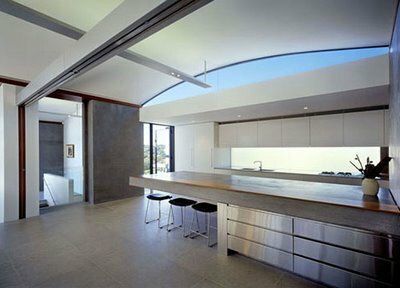 All apartments have unimpeded views to the northern bushland, and a large skillion roof floats above the walls, allowing light to filter into and through the building blocks. The roof of the lower apartments forms the terrace for the apartments above, and planters are used to replace balustrades, thus softening the building and reinforcing Popov’s idea of the apartments as a terraced garden. 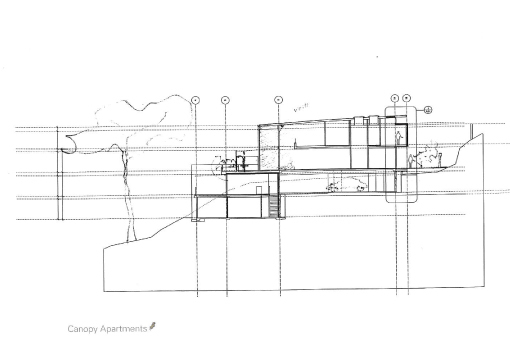 Popov’s desire to establish a relationship between the residences and between the apartment blocks and the surrounding context, is clearly demonstrating by the project’s configuration. 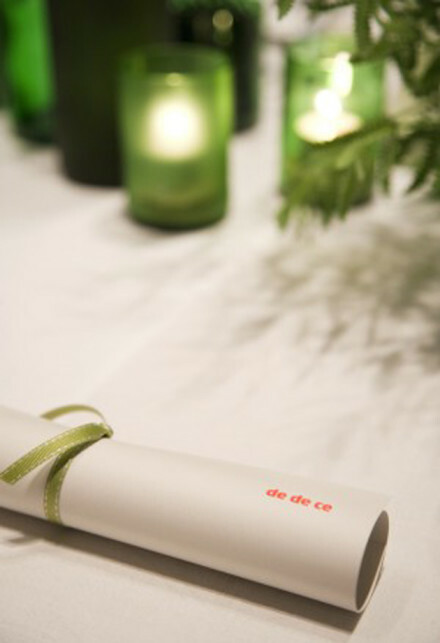 The Woolwich house is a careful study of programmatic divisions articulated by public and private, served and serviced. 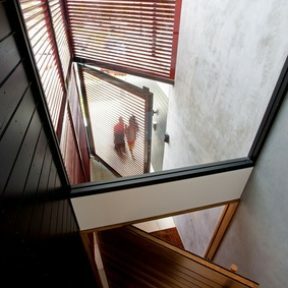 Underpinning these tectonic moves, a highly curated spatial narrative moves from a narrow suburban street frontage down into the body of the house where it is then redirected – refocused – out towards an intimate harbour-side view across the Parramatta River to Balmain and to the city beyond. 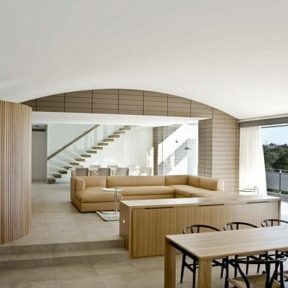 Unlike Popov’s previous harbour-side houses, this one is in close proximity to the harbour and looks directly onto the water, and the spatial strategy serves to extend the sense of arrival, delaying the final views while negotiating the pragmatic challenge of bringing people down and into the house. 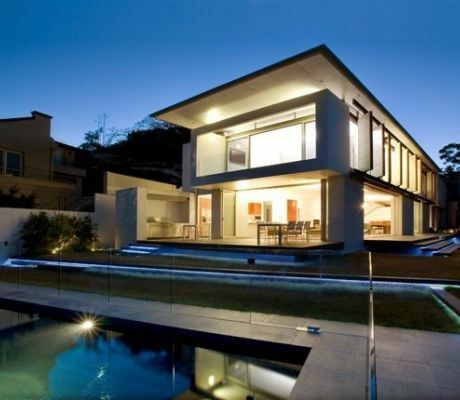 The massing of the house is formed by a dominate white rectangular volume, holding a study and bedrooms, which stretches from the entrance out and over the living spaces below, supported by the narrow wall sections that frame expansive openings on the lower storey. 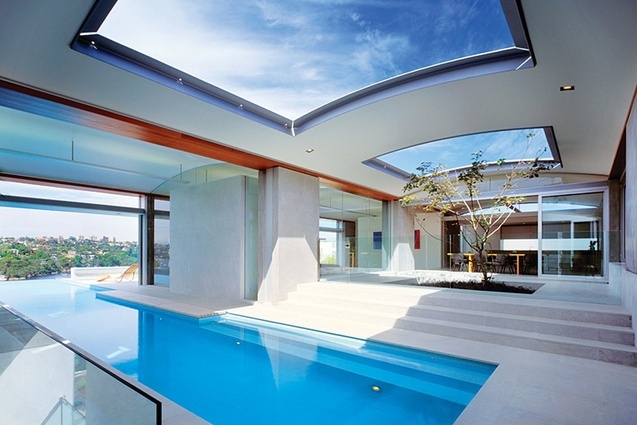 The plannar roof from cantilevers out further, emphasizing the connection to the water while providing shelter for the bedrooms and the lower living areas. Running parallel- on the services on the ground floor, and circulation for the bedrooms on the first floor. 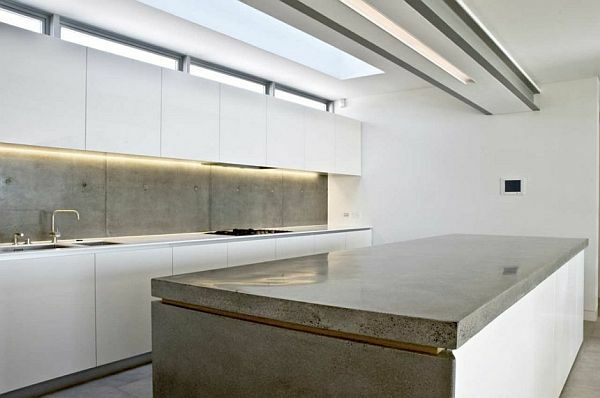 This is expressed externally by a receding volume- slightly behind the primary structure – and internally by a massive internal concrete wall that absorbs storage, divides the two domains and expresses this division between ‘served’ and ‘servant’. 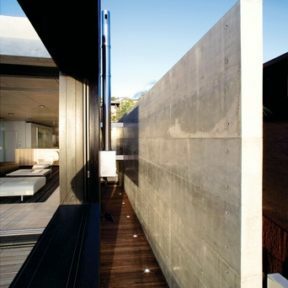 The long northern elevation, visable from terraced grassed platforms, clearly expresses the gestural impact of the long box-form floating above the living spaces. Articulating this fascade are large fixed vertical louvres of timber and concrete that frame particular views from the bedrooms, while protecting them from the sun and wind. 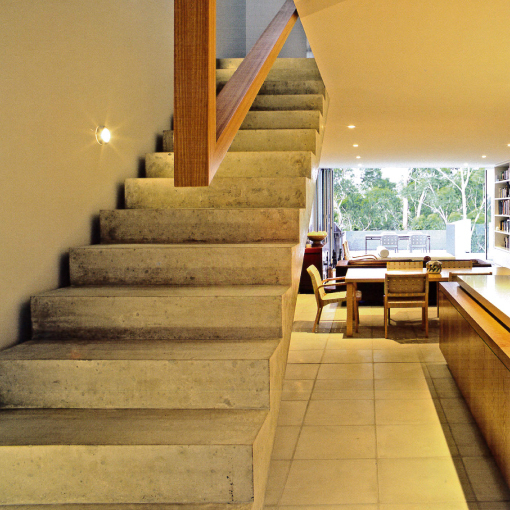 Making the transition between theupper and lower levels, a floating concrete staircase – finished with a thin Blue Gum trimming – becomes another sculptural form in its own right. The Whale Beach House does just that. Inspired by the image of a container washed ashore on the beach, the cubic form steps down a steep cliff towards the ocean. 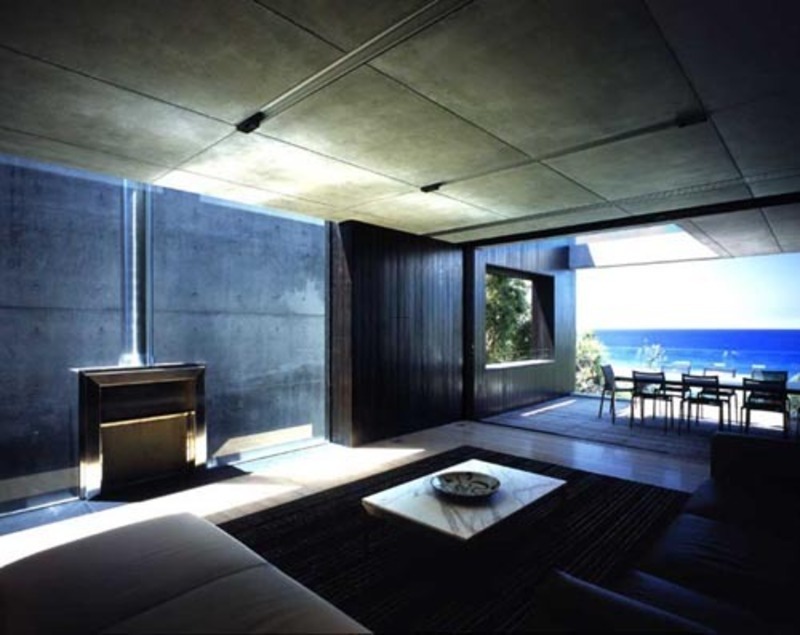 The house is braced on either side by concrete walls to shelter the interior from the exposed coastal environment. 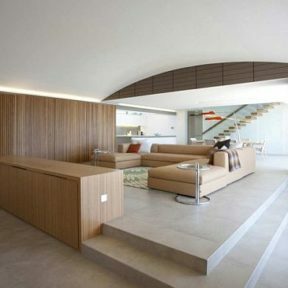 Bound by these two walls, a two-storey timber-clad box cantilevers out over the ground-floor living area. 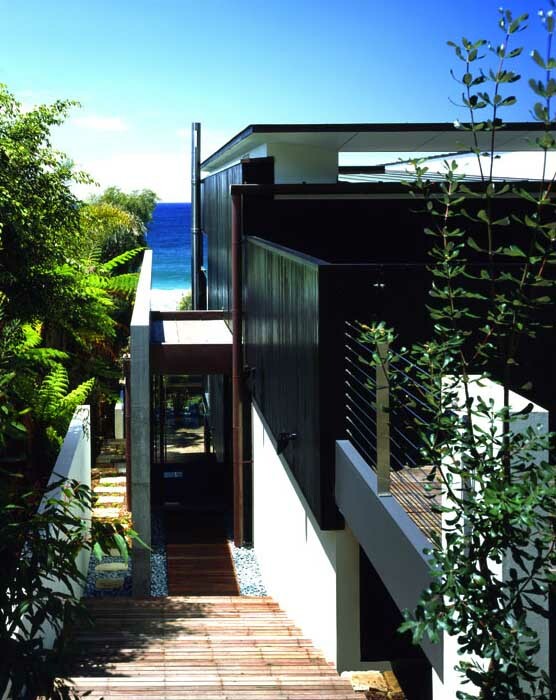 The black painted timber references the traditional timber cottages of the surrounding Pittwater region, while also providing a protective skin around the building structure. 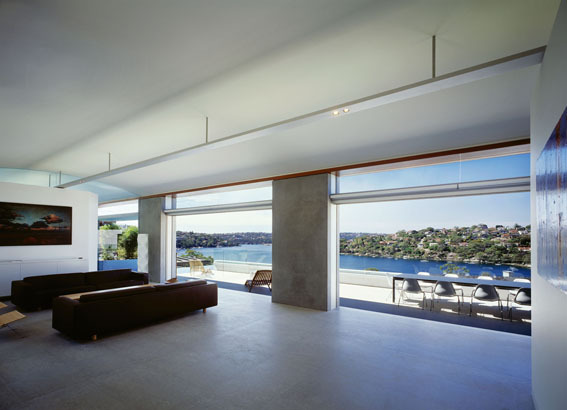 This modern version of the wooden-framed house with solid stone foundation has retained the tranquil anonymity of its predecessor but has been completely opened up to the view: a wide horizon that ends with the hammer head at Barrenjoey. 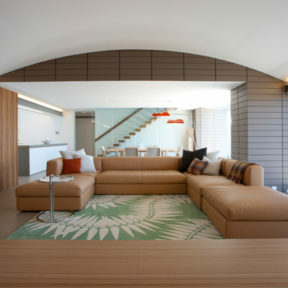 Popov enhances the exhilarating freedom of the veranda with a sailing roof to protect the intimacy of the living spaces. The mighty roof is punctured with two big square holes that have the effect of drawing northern light deep into the east-facing building, transforming the dark interior of the original house. Behind this dramatically framed view, there is an explosion of space and light. 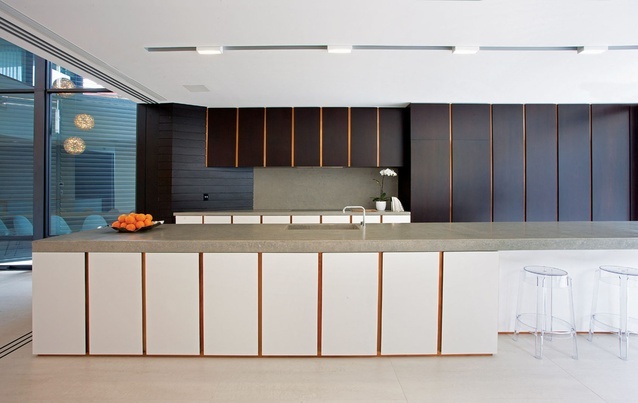 The house never reveals itself in its entirety, but the open-plan living area of kitchen, dining room and lounge forms one continuous place that is clearly defined as the heart of the house. 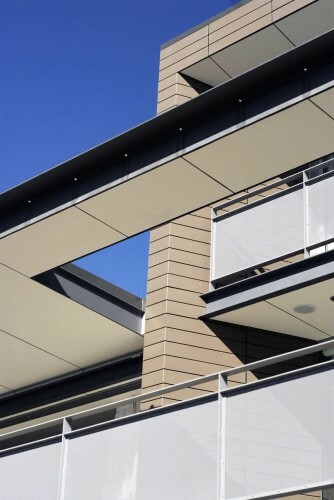 Off-white masonry is complemented by mellow-toned materials, such as limestone and American oak joinery. 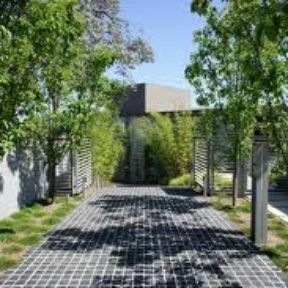 There is further opportunity for engagement with nature through an internal courtyard on the far side of the living room. 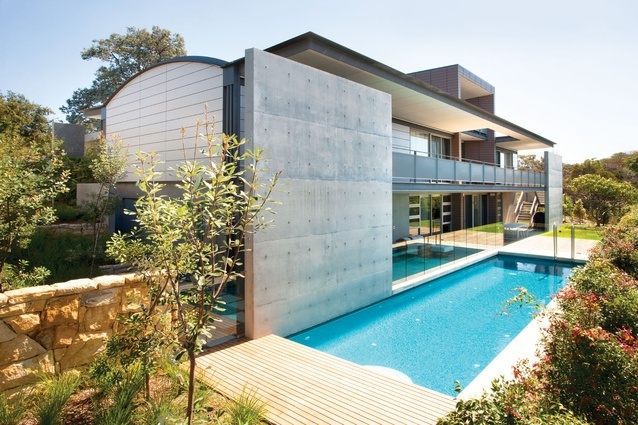 It is another realm for reflection, an internal oasis bounded by a concrete retaining wall that holds back the massive earthen embankment rising high behind the house. Remnant bits of steel have been left like twisted sculptures to poke out of the concrete as an artistic reminder of hard labour. “It took two months to excavate and stabilise that hill,” Popov says. 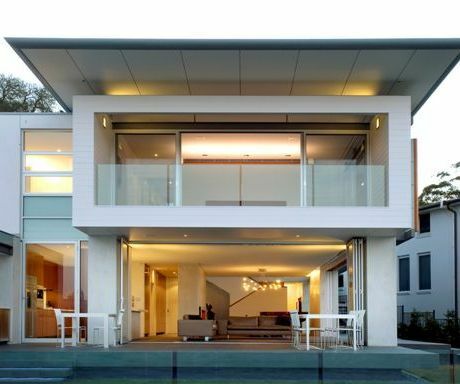 Next to this, a glassy well of light centres on a stairway that leads upstairs to the master bedroom (with ensuite, walk-in robes and balcony), or downstairs to the children’s domain. The kid zone – an entire level that consists of two bedrooms, lounge and kitchenette, a bathroom and the garage – can be locked off from the top floors. 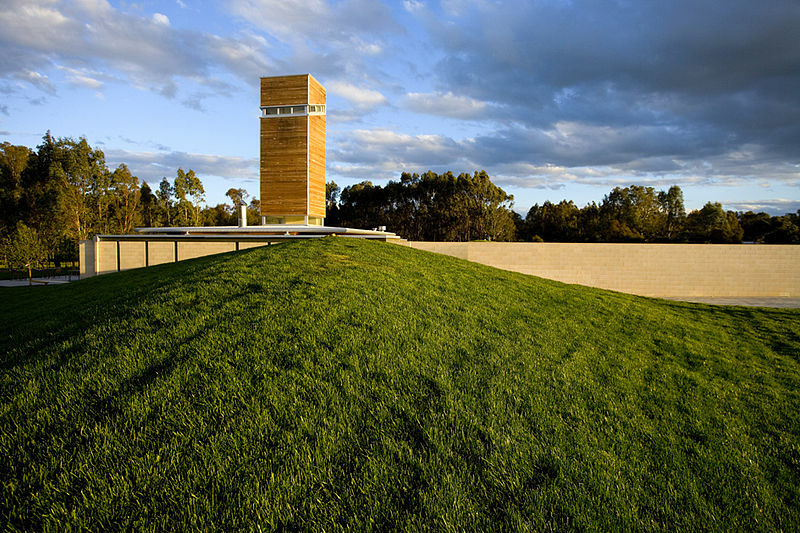 Rising above an expanse of paddocks, vineyards and farming land, and looking to the rugged tree-covered mountains of the horizon, a singular timber-clad tower placed over a simple concrete-base has become a local landmark and the symbol of the Sam Miranda Winery. The region is best known as ‘Kelly Country’, the area where Australia’s infamous bushranger Ned Kelly roamed over 150 years ago, and the tower’s form – sliced horizontally to let in light – recalls Kelly’s iconic iron helmet. Characteristic of Popov’s architecture though, the images is not literal and the architecture can equally be understood in terms of its dominant language of monumental abstraction, beautifully formed interior spaces and material application. 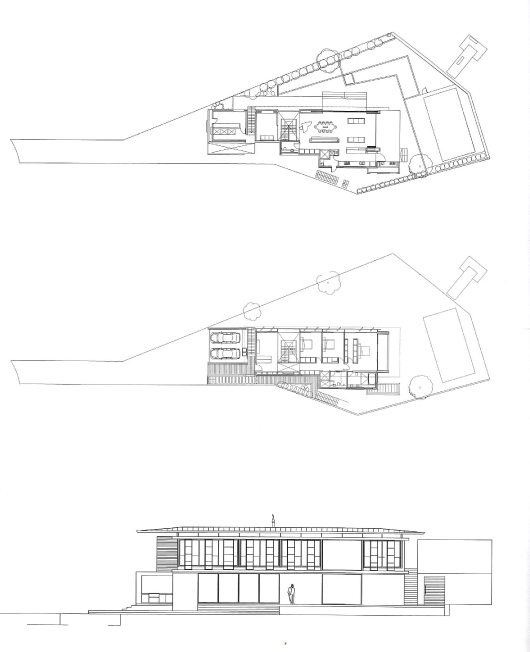 Unlike Popov’s residential projects, this program – essentially a tasting room with light food preparation and serving facilities – allowed for relatively unrestricted architectural expression, resulting in a clear demonstration of Popov’s skills for compositional assembly and spatial clarity. 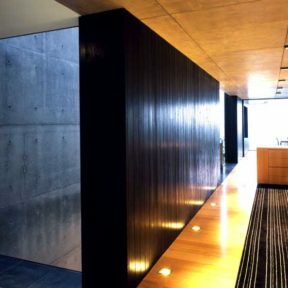 The entrance is through a blank wall offset from the main building, which forms one side of a passageway leading to the eastern courtyard and dining area. The main tasting room sits to the south of this passageway. Placed directly over the tasting counter, the tower is internally clad with white walls, with the southern wall undulating down towards the counter space, mimicking the curving line of the wine glass. 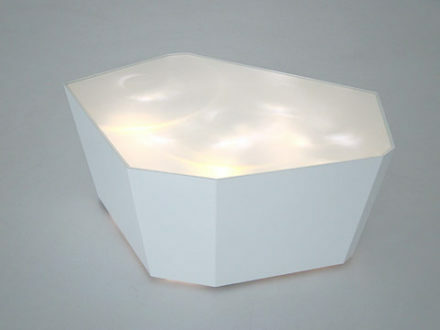 The effect is of a dramatic light captured, then reflected down the tower and spilling out into the main volume. The detailing is elegant and precise, with the tasting counter framed by large concrete columns, which serve as structural support and to float just above the columns and, in contrast to the masonry walls and floor, is lined with a delicately crafted warm-toned timber. 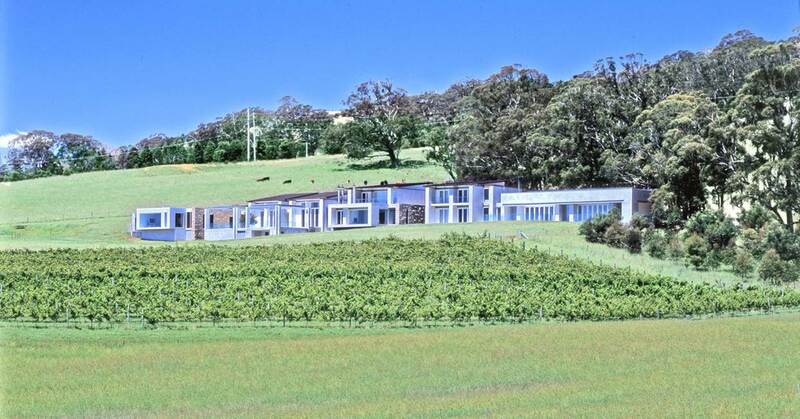 Full-height concrete blades are placed at the threshold to the eastern courtyard, establishing a rhythmic sequence that resonates with the vineyards, and the flat roof extends out as a generous overhang, protecting the interior from the harsh Australian sun. 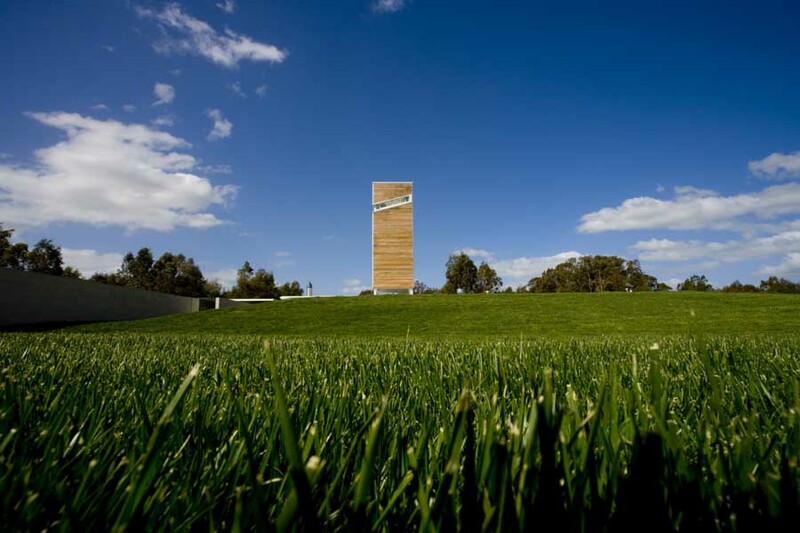 This building, representing the first stage of a three-tower project, is a delightful counterpoint to popov’s residential projects: without the demands of efficient apartment planning or the complexities presented by large-scale houses and tight urban sites, the architecture effortlessly creates a sculptural object within a green-field landscape. Not just a folly, the architecture continues Popov’s rigorous tectonic explorations: a pursuit that challenges regional vernaculars, and offers solutions that have their origins in Scandinavian modernism rather than in romanticized images of rural Australia. 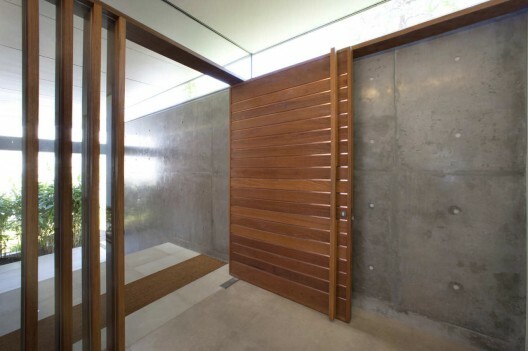 This approach is reflected in the recently completed No. 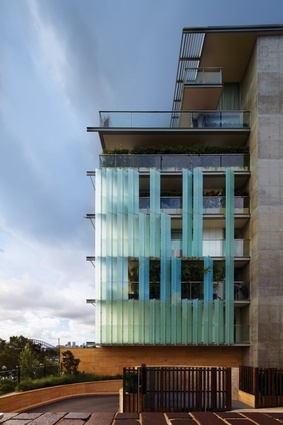 1 Grantham, a boutique apartment building in the inner-city neighbourhood of Potts Point. Consisting of eight whole-floor apartments, the design balances the provision of light, air and views with the need for privacy in a dense urban setting. “As an urban form, this is about securing you from the density of the environment but still allowing those views in the distance,” says Brian. Taking in extensive city skyline views, the western facade is characterized by deep balconies that shield the living areas from late afternoon sun. Translucent glass blades activate the main street facade, filtering air and light into the apartments while screening the interior from neighbouring buildings. Internally, each apartment is provided with a private entry foyer, spacious living areas and bedrooms that open out onto sheltered balconies. “It’s an instance where you have the requirement that the people who live in these apartments achieve the same outcome as if they were living in a house,” explains Alex. 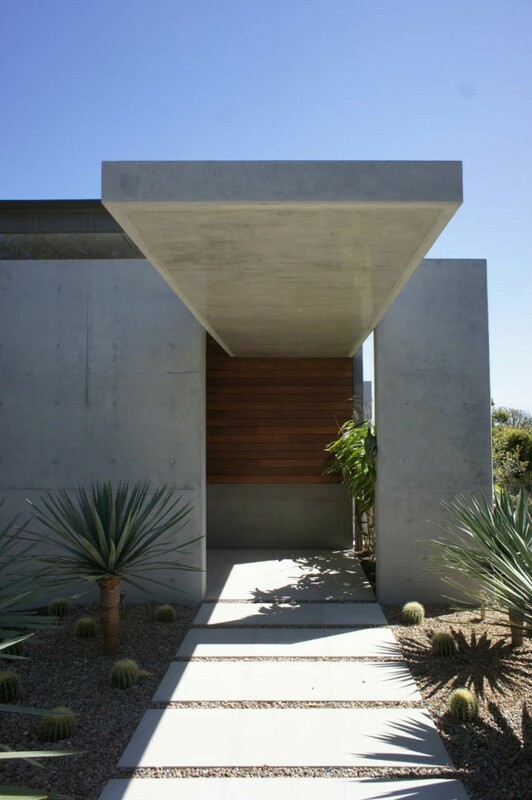 The concrete walls anchor the house solidly into the ground, lodging it securely within the landscape. This sense of monumentality is one of the defining features of the work of Popov Bass and is related to Sydney’s sandstone foundations. 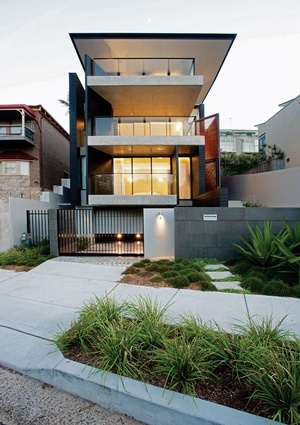 The sheltered harbour setting of the Kirribilli House required a less robust response. 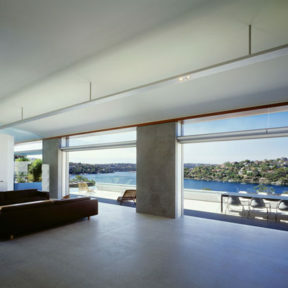 Framed by white painted brick walls, the house presents a Mondrian-like elevation to the harbour. The steel, timber and glass composition is designed to capture distinct views of distant landmarks while also expressing the functions of rooms within. 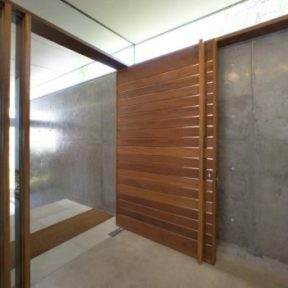 In this way a narrow vertical slot reflects the stairs leading down from the street-level entry, while deep recesses on the upper floor conceal bedrooms and a study. 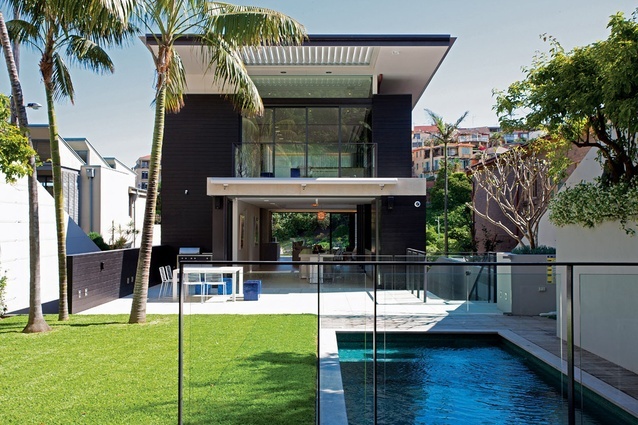 This urban beach house by Popov Bass Architects has the best of both worlds, designed with a strong connection to the ocean at the front and a private garden oasis at the rear. 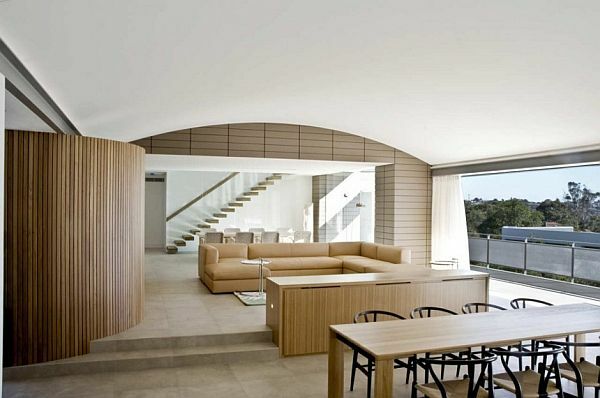 This beachside house in Sydney does not pretend to be a shipwreck, a wave or a jellyfish. It’s neither town house nor weekender, but something in between. 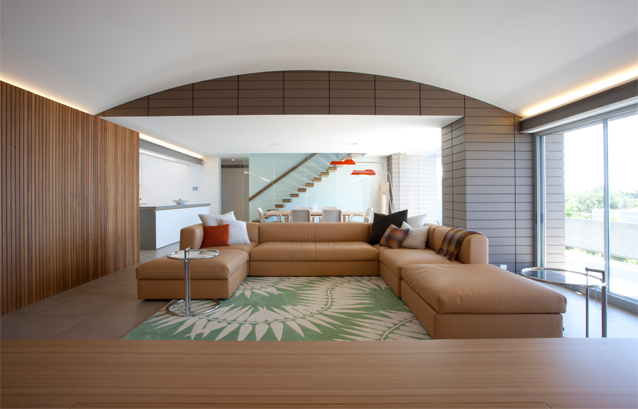 “One of the clients is a keen surfer and wanted the relaxed feel of a beach house with the everyday utility of a family home,” explains architect Alex Popov of Popov Bass, a firm that’s been exploring the urban beach house typology in Sydney for several decades. The Popov Bass team pinched and stepped the building in off the boundaries to manage sight lines and sun from every angle. Although four storeys high, it looks slimmer than most of the neighbouring houses. 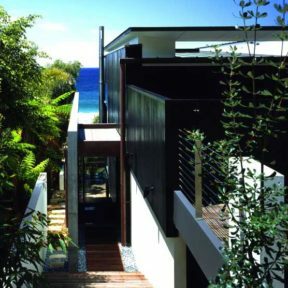 Its exterior walls of black-stained recycled hardwood are a nod to the weatherboard vernacular, and are toughened with deep concrete balconies and titanic red steel rib cages, all gathered under a low-pitched copper roof. The red steel does more than just bracket the building. On the south-east corner, the two-storey entry cage allows the heavy oak front door to be kept wide open, pulling breezes into the building. 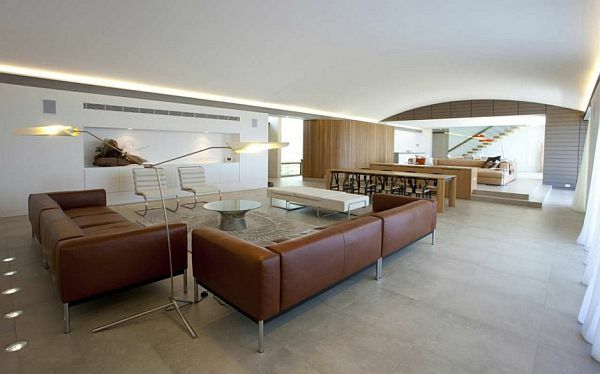 On the western face, the steelwork defines the big light gesture that brightens the interior. “Given that the site faces the wrong way in solar terms, the challenge for us was to bring light into the centre,” says project director Brian Bass. “We did this with what we call the gills – a set of giant steel screens off the dining room.” Pointing north and featuring articulating blades, the three screens shutter light from the north into a dramatic two-storey void space that cuts through the top two communal volumes. 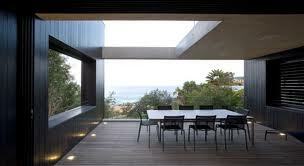 On level three, the dining room sits under the void, between the beach-facing living area and garden-facing kitchen. 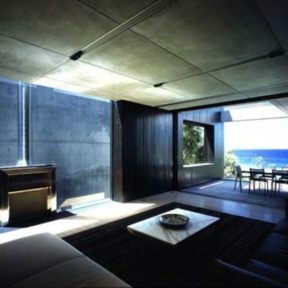 On the fourth level the void separates the study from a second sitting room facing the ocean. 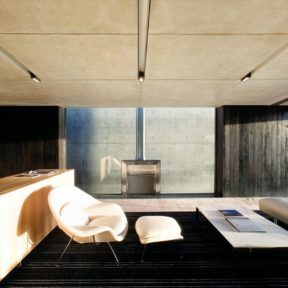 Both communal levels are open eighteen metres front to back, but can easily be partitioned with concealed sliding doors beside the void. 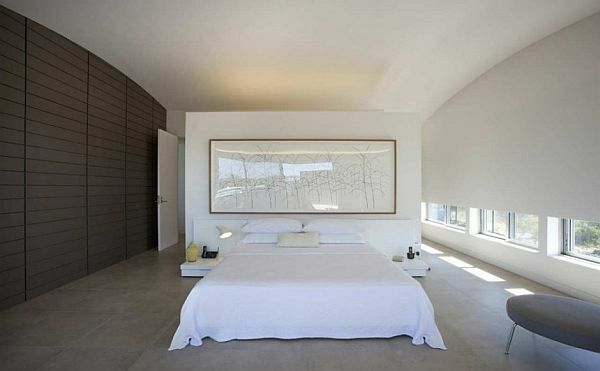 Space is more structured on the first-floor sleeping level. 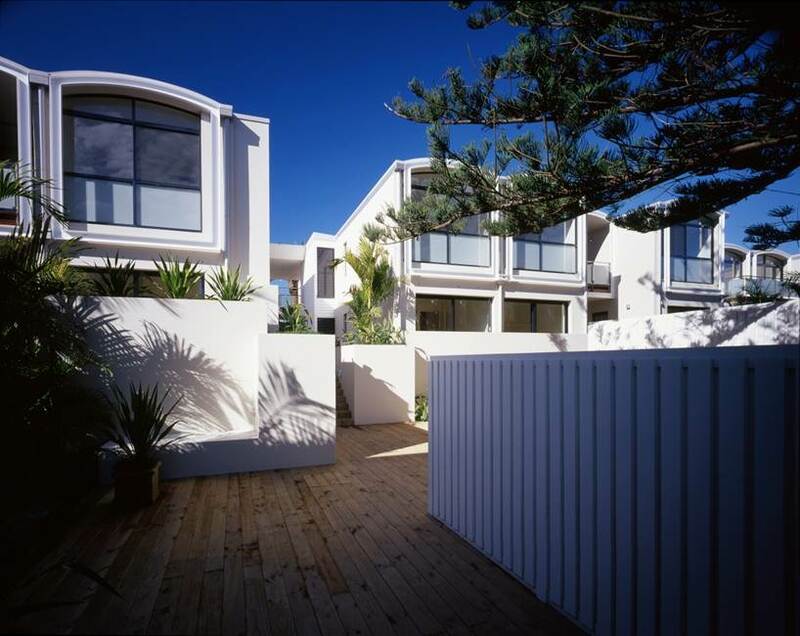 The main bedroom and ensuite have the prime position – a deep balcony faces the ocean – while the bedrooms behind enjoy one of the hidden gems of the house, a private courtyard and light well cut from the rock shelf along the western edge. 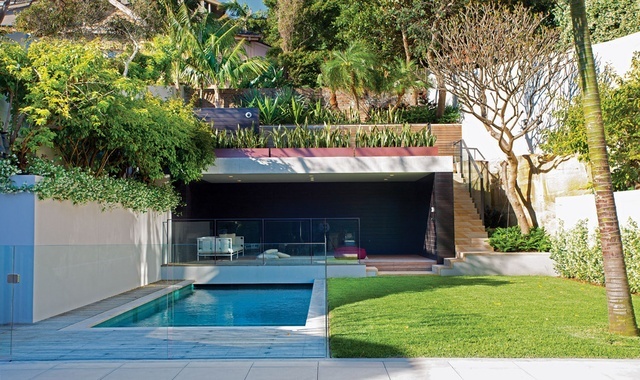 Included in the clients’ brief was a level garden with a lawn and pool, “where the children could play and be seen from the kitchen,” says Popov Bass’s Leigh Woodley, project architect for Sydney House. While the front garden has only a patch of hardy natives to face the whipping salty winds, the rear garden is now a tropical paradise. 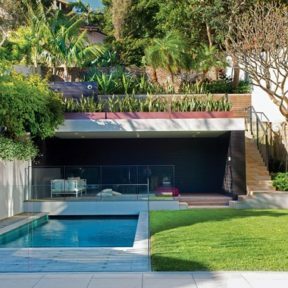 It was landscaped by Will Dangar, with mature frangipanis, bougainvillea, palms and ginger set around the lawn and blue-tiled swimming pool. 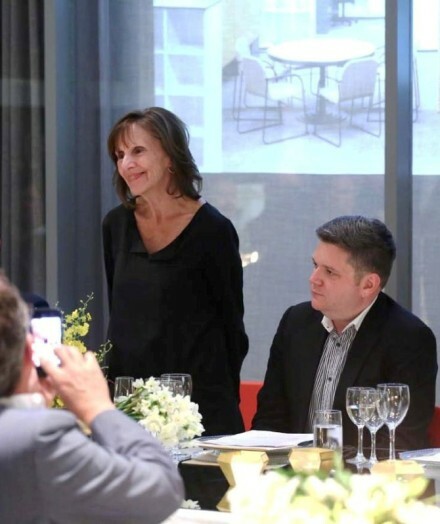 Whether designing suburban homes, coastal escapes or urban apartments, Popov Bass seeks to enhance the lives of each building’s inhabitants through a considered response to lifestyle, site and context. 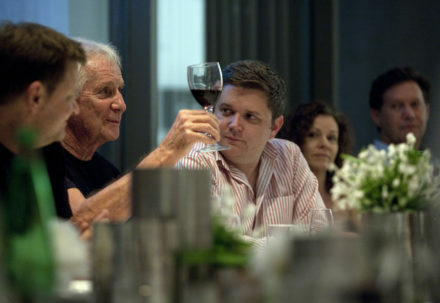 Popov disparages the cult of the celebrity architect, preferring instead to let his work speak for itself. 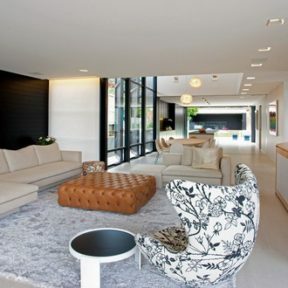 Alex Turco is an art designer based in Milan, whose work complements modern, innovative interiors…. 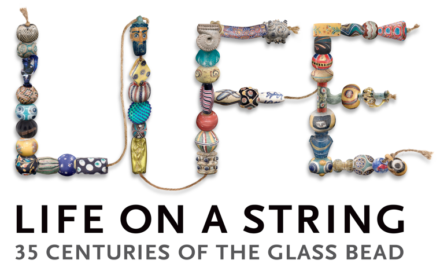 Life on a String: 35 Centuries of the Glass Bead showcases, for the first time, nearly 200 important works from the large historical glass bead collection of The Corning Museum of Glass. Click on the image above to see the Artecnica web-browser movie invitation !